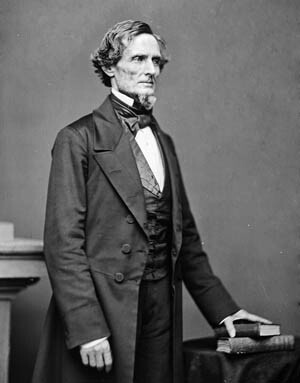 With Richmond in flames behind them, Confederate President Jefferson Davis, his family, and high-ranking government officials began a desperate dash southward. Their ultimate destination was Mexico. Fugitive Confederate President Jefferson Davis, seated on the left, signs official papers for a non-existent government during his flight southward following General Robert E. Lee’s surrender at Appomattox. When the end came, on April 2, 1865, Confederate President Jefferson Davis was sitting in his customary pew at St. Paul’s Episcopal Church in Richmond, Virginia. A messenger interrupted the Sunday service to deliver a sealed telegram from General Robert E. Lee, then some 25 miles to the south defending Petersburg. “I advise that all preparation be made for leaving Richmond tonight,” Lee reported tersely. For the better part of a year, Lee’s Army of Northern Virginia had held off three Union armies under Lt. Gen. Ulysses S. Grant, but the previous day the Federals had finally broken through at Five Forks. With Union troops threatening his main line of supply and retreat, Lee had no choice but to abandon Petersburg and race west, away from the capital. Richmond was doomed. As president, Davis’s task had suddenly become to lead the Confederacy in defeat more adeptly than he had ever led it in victory. Having commanded the 1st Mississippi Regiment in the Mexican War, the West Point-educated Davis fancied himself something of a military expert. He had desired to serve the Confederacy not as its president but as overall commander of its armies and endeavored to run the nation as a military operation. Autocratic governance, however, had proven ineffective in a nation based on states’ rights. Southern governors largely went their own way, sending or withholding troops as they saw fit and printing their own money. Inflation was near 6,000 percent, and the Confederacy was $700 million in debt. There had been food riots in Richmond, and city matrons had been reduced to serving river water at “starvation balls.” On the war front, Davis had accepted slaves into Confederate armies with a promise of freedom for those who fought, but Southern troops were still outnumbered 10-to-1. When Lee surrendered, it was left for Davis to carry on alone. Davis at the end of the war. “I went to my office,” Davis recalled, “and assembled the heads of departments and bureaus, as far as they could be found on a day when all the offices were closed, and gave the needful instructions for our removal that night, simultaneously with General Lee’s withdrawal from Petersburg.” Each department head was to see that important documents and records were packed and ready to go and the rest destroyed. Leftover stores of cotton and tobacco were to be burned. The remaining national treasury of some $500,000 in gold nuggets, double eagles, silver bars, and Mexican coins was to be crated and taken along. The government would entrain for Danville, on the North Carolina border, at eight that evening. Anyone and anything not on board then would be left behind. The meeting was cut short by the rumble of cannon fire in the distance. Davis had auctioned off the family horses, silver, and valuables for $28,400. He sent Confederate treasurer John Hendren with the check to the Bank of Richmond. Hendren returned with the news that the bank would not cash it, even when presented by the treasurer of the Confederacy on behalf of its president. The banks were choked with customers clamoring for their deposits, even as officials piled together millions in worthless paper notes for burning. Meanwhile, bank officials insisted on sending junior managers along to supervise the guarding of the government treasury, half of which legally was theirs. Liquor poured into the gutters to deny the invader was instead scooped up by rowdies and hooligans as taverns and saloons emptied and crowds gathered in the streets. Supply houses and depots were thrown open to the citizens, who had been too long denied. “The most revolting revelation,” wrote Maj. Gen. George Pickett’s wife, LaSalle, “was the amount of provisions, shoes and clothing which had been accumulated by the speculators who hovered like vultures over the scene of death and desolation. Taking advantage of their possession of money and lack of both patriotism and humanity, they had, by an early corner in the market and by successful blockade running, brought up all the available supplies with an eye to future gain, while our soldiers and women and children were absolutely in rags, barefoot and starving.” The crowd’s mood soon turned ugly. The scene at the station was little better. The last trains out of the city sat huffing on the line. Troops endeavored to control the refugees jamming the platform, the insides and tops of the passenger cars, boxcars, freight cars, and even the locomotives. The treasury gold had been boxed and loaded, with 60 cadets from the naval academy drafted to guard it. Davis calmly awaited any last-minute reprieve from Lee at Petersburg. None came. Finally, at 11 pm, the president boarded last and the trains pulled out for Danville. 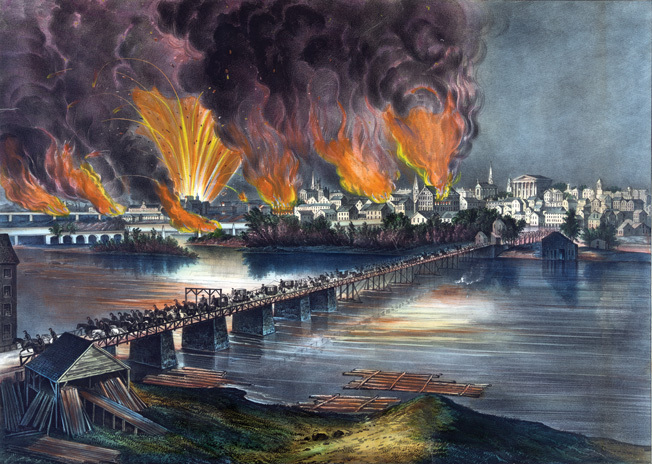 Richmond burns in the distance as Confederate troops, government officials, and panicked civilians flee the Confederate capital on the night of April 3, 1865. With government authority gone, Richmond quickly tumbled into anarchy. The last of the city garrison pulled out in the early hours. Throngs of maddened citizens, deserters, and criminals newly escaped from the state prison became mobs of drunken rioters and looters. 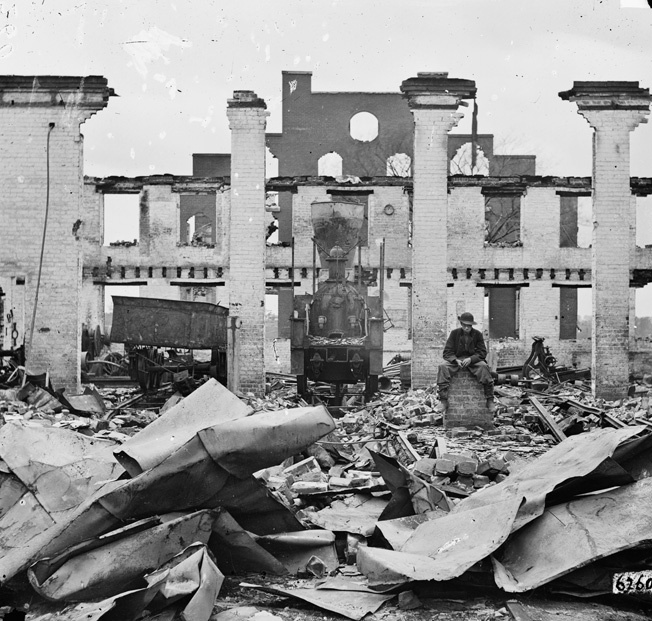 Fires from government storehouses spread to the city, punctuated by explosions from ammunition magazines and ironclads scuttled at the riverfront, blowing out windows two miles away. By dawn a third of the city, including the entire business district, was on fire. In Danville, Davis knew none of this. Telegraph lines from the north had been cut. It was not until Saturday that the president learned that Lee had been trapped near Appomattox, and Monday when word came of his surrender. Davis did not for a moment contemplate following his commanding general’s example. “Certainly better terms for our country could be secured by keeping organized armies in the field,” he wrote, “than by laying down our arms and trusting to the magnanimity of the victor.” He wired Johnston of the change in plans. With Lee out of the war, he said, they would meet in Greensboro, North Carolina, the headquarters of General P.G.T. Beauregard. There was no time to lose. Union horsemen were reportedly already closing in. If the rails to Greensboro were cut, it was all over for Davis and his party. The scene at the Danville station was, if anything, even more desperate than at Richmond. Ten passenger cars were not enough to accommodate all those seeking to escape. Two more cars were added over the protests of the train crew, who were proven right when their old locomotive blew a cylinder just a few miles out of town. The government sat defenseless on the line until another engine could be brought up. Their escape was so narrow that Union cavalry burned a railroad bridge just moments after the train passed over it. With so little to cheer about, Davis smiled when he heard the news. “A miss is as good as a mile,” he joked. Ruins of the Richmond & Petersburg Railroad depot, with the remains of a smashed locomotive in the foreground. Behind them Dansville went the way of Richmond. Two companies of troops left behind to maintain order and protect stores were not up to the task. “Our children and we’uns are starving,”cried a woman at the head of a mob, “the Confederacy is gone up; let us help ourselves.” The troops gave way and the looting began, at least until a nearby ammunition train caught fire and exploded, killing 50 people. Thinking that Federal forces had attacked, the rioters scattered in panic. Secretary of the Navy Stephen R. Mallory. Most officials didn’t even bother to disembark but set up living spaces aboard the train. 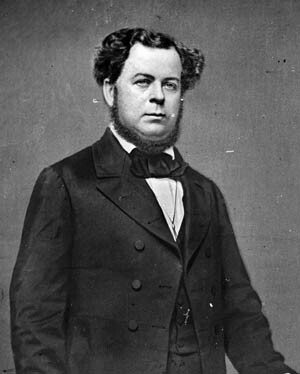 National affairs were run out of a dilapidated, leaky “cabinet car.” Secretary of the Navy Stephen Mallory recalled that matters of state sovereignty and secession mattered less than “more pressing and practical questions of dinner or no dinner, and how, and when and where it was to be had, and to schemes and devices for enabling a man of six feet to sleep upon a car seat four feet long.” For his new White House, Davis took a 12-foot by 16-foot boardinghouse room with a single bed, table, and chair, in which he convened a strategy meeting on Thursday morning, April 13. Reports by Beauregard and Johnston were not encouraging. Mobile had fallen; Raleigh was on the verge of surrender; Sherman was just 50 miles from Greensboro. Johnston estimated that he could field about 25,000 troops. Grant and Sherman, by contrast, had about 350,000 under arms. Davis, however, still planned to enlist fresh conscripts and rally deserters to the flag. “An army holding its position with determination to fight on, and manifest ability to maintain the struggle, will attract all the scattered soldiers and daily rapidly gather strength,” he maintained. 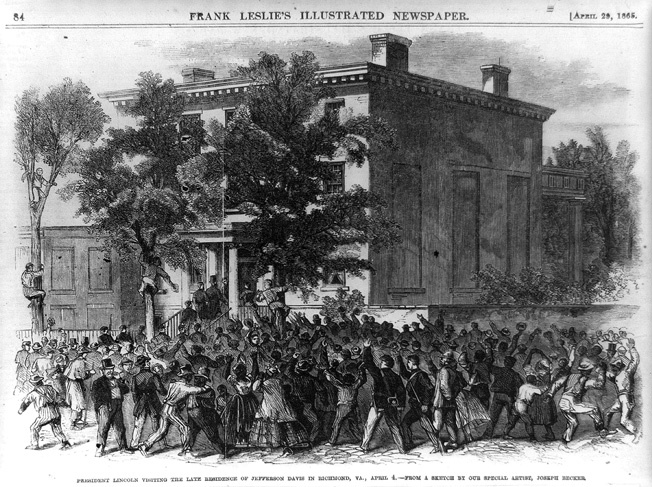 President Abraham Lincoln, accompanied by a throng of black and white supporters, enters the Confederate White House, where he would try out Jefferson Davis’s former chair. In Greensboro, the going had become no easier. Since Union forces had cut the rail line south to Charlotte, the Davis party could only proceed on horseback. The treasury funds were divided, with $39,000 in silver left to Beauregard and $288,000 loaded onto wagons, along with most government records and papers. Recent rain having turned the roads to mud, an artillery unit was drafted into service to manhandle the wagons. Tennessee and Kentucky cavalry units, about 1,300 riders in all, were enlisted as escorts. With that, the Confederate government vanished into the countryside. As expected, Johnson, following Stanton’s advice, rejected the treaty. Johnston was to surrender unconditionally or the truce would expire in 48 hours. 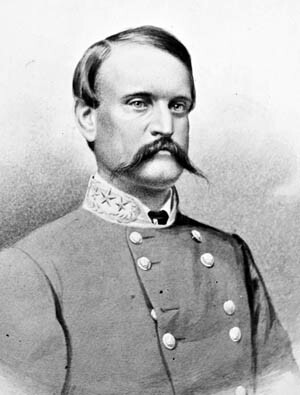 Without further consulting Davis, Johnston agreed to the terms, not only signing over his troops in North Carolina, but also those in South Carolina, Georgia, Alabama, and Louisiana—basically all Confederate forces east of the Mississippi except for Davis and his government, whose surrender was not subject to negotiation. Quite the contrary. Stanton had telegraphed his generals that the Rebel chiefs had with them $13 million in gold plunder, which would go to anyone apprehending them. Confederate General Joseph E. Johnston, right, realized the futility of prolonging the war and urged Davis to negotiate. 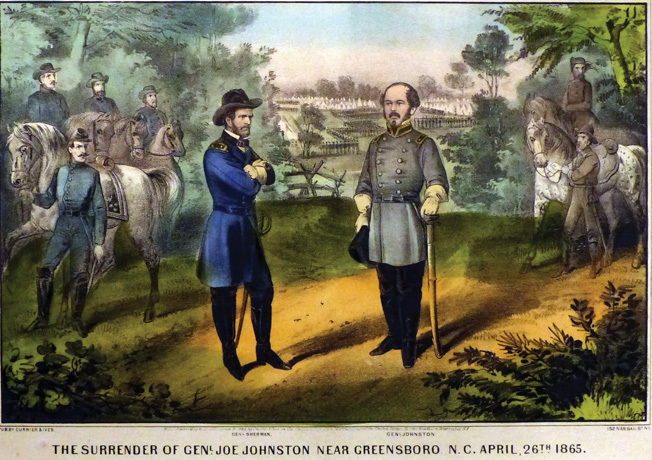 Johnston surrendered his own army to Maj. Gen. William Tecumseh Sherman, left, at Bentonville, North Carolina. Varina replied from Abbeville. “A stand cannot be made in this country as to the trans-Mississippi,” she wrote. “I doubt if at first things will be straight, but the spirit is there.” She did not plan to wait for Northern mercy, but to escape via Florida and Bermuda or the Bahamas to England, where she might leave their eldest children in school and rendezvous with her husband in Texas. Confederate Maj. Gen. Wade Hampton felt that Johnston had exceeded his authority in surrendering and that it would be “far better for us to fight to the extreme limits of our country rather than to reconstruct the Union upon any terms.” Some five brigades, about 3,000 fighting men, agreed. They made Davis the military commander of the largest Confederate army east of the Mississippi. “I cannot feel like a beaten man,” he said. When the presidential party departed Charlotte on April 26 and pushed into South Carolina, they found the going slow, their progress hampered by well-wishing crowds strewing flowers in their path. Sherman’s march through central Georgia, then up the Carolina coast, had never intruded on this area of the country. Unfamiliar with the horrors wrought on their neighbors, these Southerners had nothing but admiration for Davis in his hour of retreat. “Some of the command thought we went too slow,” admitted Davis, no doubt reliving the optimistic days of 1860, when the Confederacy had repelled every Union attempt to subdue it, ultimate independence had seemed possible, and its president had led a noble uprising against oppression. But cavalry commander Brig. Gen. Basil W. Duke saw what his footsore troops did not: that Davis was “traveling like a president and not like a fugitive.” In those last weeks of April 1865, Davis had transcended himself from a controversial, often derided politician into a supreme symbol of Confederate resistance. By his very refusal to give up, he kept the Southern nation—at least temporarily—alive. 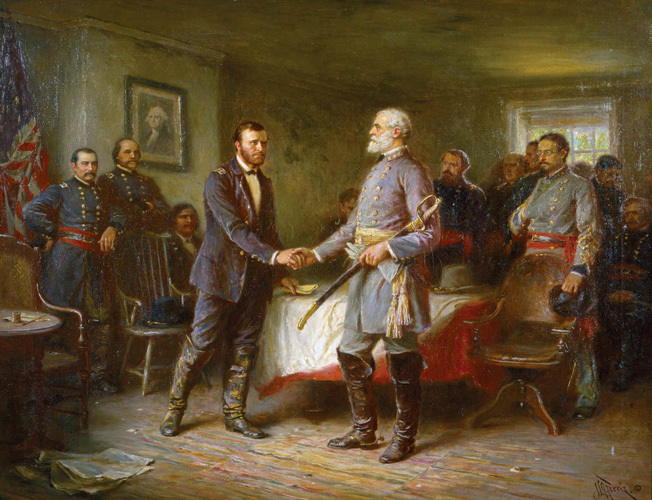 Ulysses S. Grant and Robert E. Lee shake hands after concluding the surrender terms at Appomattox. Davis hoped that Confederate forces still in the field would continue the war despite Lee’s surrender. He left the meeting. In his absence, his commanders and cabinet members devised the ways and means of dissolving the Confederacy. Remaining archives and records were to be abandoned or destroyed. The troops would be permitted to vote on whether to march on or disband. In the town streets they were already selling their uniforms and weaponry as souvenirs. It would only be a matter of time until they turned covetous eyes on the government gold. The treasury rail car was kept under armed guard, not against Union attack but against looting by their fellow Confederates. It was decided to get both the president and the treasury out of town. Around noon on May 3, Davis and his party rode into Washington, Georgia, a little town of 2,200 whose only experience of the war was a recent influx of lice-ridden ex-Confederate troops. As one resident put it, “The foot of a Federal soldier had never trodden our streets. We were a little out of the way village, in a farming country, where the hardships and deprivations of the war, for food, had never penetrated.” The irony of reaching the end of the Confederacy in a town named Washington escaped no one. While the president and his party took much needed food and rest, Breckinridge spent the day trying to mollify the troops back at the river, many of whom were throwing away their weapons and walking off to surrender. Davis appointed Captain Micajah Clark as acting Confederate treasurer and sent him to see to final disbursal of the government funds: $230,000 to the Richmond bank officers; $86,000, secreted in a false carriage bottom, on its way to Charleston and thence the Confederate government account in London banks; and $30,000 to cover Davis’s escape. Davis’s party, carrying the final $500,000 of the Confederate treasury, crosses the Pee Dee River in South Carolina. His cavalry being “not strong enough to fight and too large to pass without observation,” Davis wrote back, “I can no longer rely upon them in case we should encounter the enemy. I have therefore determined to disband them and try to make my escape. We will cross the Mississippi River and join [General] Kirby Smith, where we can carry on the war forever.” The idea of reviving the South again in the West was perhaps not so farfetched. It would take Federal troops several more decades to subdue hostile Plains Indians, many of whom had made common cause with the Confederacy. How they might have fared against 40,000 Confederates is an open-ended question. As a diversion, Davis sent Breckinridge off with the bulk of the remaining cavalry. Former naval officer Colonel Charles Thorburn mapped a route to the east coast of Florida, where he had a boat hidden on the Indian River. From there Davis might sail around the peninsula and across the Gulf of Mexico to Texas. 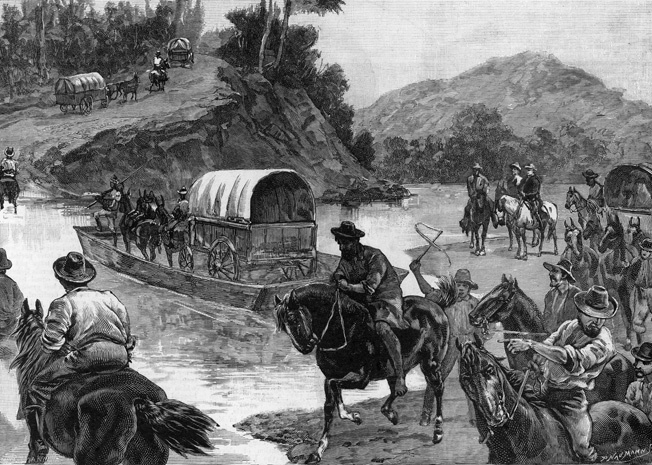 Davis rode out with just 10 picked men, one wagon, and two ambulances. Union cavalry rode into town 12 hours behind them. 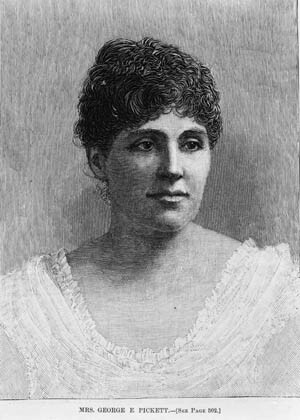 In a few days Davis closed to within 20 miles of Varina’s party, only to learn that a band of ex-Confederate marauders was on her trail. “I do not feel that you are bound to go with me,” he told his men, “but I must protect my family.” They rode so hard that several were left behind when their horses gave out. 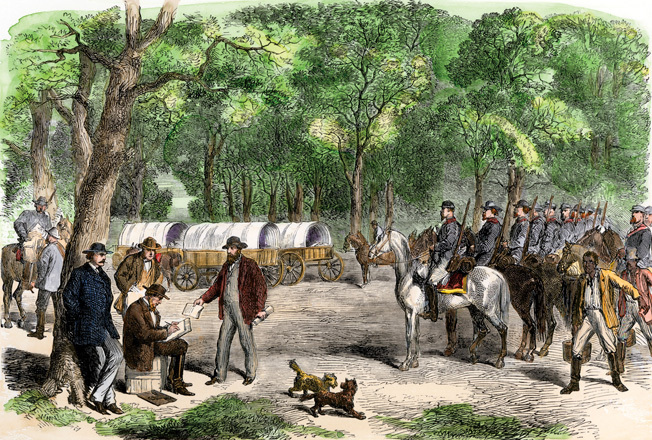 Outside Dublin, Georgia, Davis and the remainder spotted a small circle of wagons. A sentry called, “Who goes there?” and Davis recognized the voice of his secretary, Burton Harrison, who had escorted Varina and the children all the way from Richmond. The happy reunion was short lived. Union forces were tightening the net. The Johnson administration had announced a $100,000 reward for Davis’s capture. By May 9, Lt. Col. Henry Harnden’s 150-man 1st Wisconsin Cavalry, linking up with Lt. Col. Benjamin D. Pritchard’s 400-man 4th Michigan Cavalry in Abbeville, learned the Davis wagon train was just hours ahead, headed for Irwinville. That evening they split up again to search it out and, unknown to each other, converged on it from two different directions. Word immediately spread that the Confederate president had been captured in his wife’s clothes. “Jeff Davis Captured in Hoop Skirts” and “Jeff Davis in Petticoats” were two of the headlines in Northern newspapers. Cartoonists drew laughter for months with drawings of an effeminate-looking Davis mincing about in a shawl and dress. At least one of the Union soldiers on hand that day, Captain James H. Parker, went out of his way to shoot down the absurd story. “I defy any person to find a single officer or soldier who was present at the capture who will say upon his honor that he was disguised in women’s clothes. Hi wife behaved like a lady, and he as a gentleman, though manifestly chagrined at being taken into custody. I am a Yankee, full of Yankee prejudices, but I think it wicked to lie about him.” Still the story endured. Taking their prisoner to Macon, Davis’s captors taunted passing Confederates, “Hey, Johnny Reb, we’ve got your President.” One defiant onlooker responded, “Yes, and the devil’s got yours.” Other paroled soldiers were less forgiving. Told by the Federals, “We’ve got your old boss back here in the ambulance,” the men replied bitterly, “Hang him! Shoot him! We’ve got no use for him. The damned Mississippi Mule got us into this scrape.” His apotheosis as a Southern martyr was not yet underway. Within days Davis was bound for Fort Monroe, at the southernmost tip of Virginia’s York-James peninsula. “Try not to weep,” he told Varina as his captors marched him within the building. “They will gloat over your grief.” Inside the fortress walls, 30 feet high and 100 feet thick, a subterranean gunroom had been converted into a cell especially for the leader of the rebellion. Davis was locked into heavy manacles. The dank chamber was lit around the clock. His guards were changed every two hours. With no sun, little sleep, and his chains wearing him down, Davis’s health declined. 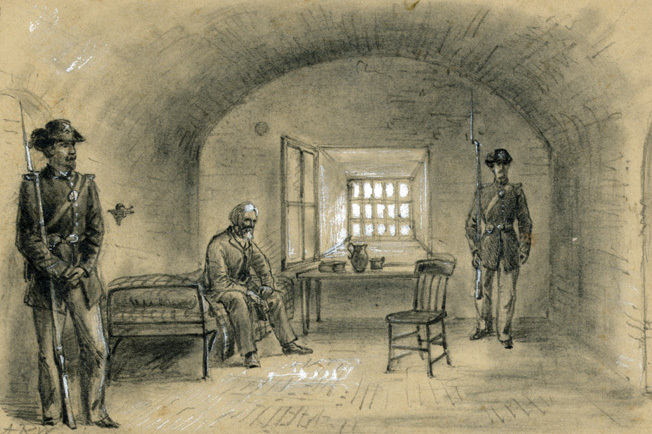 A weary and suddenly aged Jefferson Davis sits in chains under guard in his cell at Fort Monroe. He was released on bond two years later by President Andrew Johnson. The Johnson administration couldn’t decide what to do with him. Trying ex-Confederate leaders for treason would do nothing for reconciliation. Northern sympathizers and even Pope Pius IX championed Davis’s freedom. After two years, Johnson, falling out with Stanton and facing (ultimately successful) threats of impeachment, didn’t need the continuing headache. Davis was simply released on bond. He and his family moved to Canada, Cuba, and Europe before settling in Mississippi. His massive two-volume history of the war, The Rise and Fall of the Confederate Government, went a long way to establishing Davis’s reputation, for better or worse, as a leader and icon of the South’s Lost Cause, a term he coined first. “When the cause was lost, what cause was it?” Davis wrote. “Not that of the South only, but the cause of constitutional government, of the supremacy of law, and the natural rights of man.” It was, perhaps, the best face he could put on a ruinous war of choice that had cost the lives of more than 600,000 Americans, left the South destitute, and destroyed his own reputation as a political statesman. Tags Abraham Lincoln, Andrew Johnson, Appomattox, Army of Northern Virginia, Confederacy, Edwin Stanton, Fort Sumter, general edmund kirby smith, General John C. Breckinridge, general joseph e johnston, general pierre gustave toutant beauregard, George Picket, Jefferson Davis, Mexican-American war, Richard Taylor, Richmond, Robert E. Lee, Stephen R. Mallory, Union Army, Wade Hampton, William E Seward, William T. Sherman. Is Civil War Quarterly still being published? If so, please send subscription information. Hi Danny: I am afraid Civil War Quarterly has been discontinued. 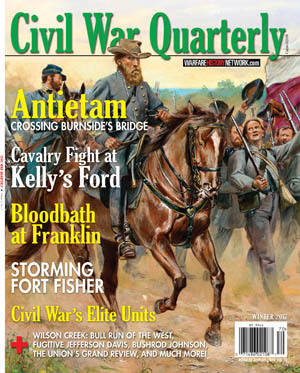 However, we do offer back issues of Civil War Quarterly in our store. You can find these issues here: https://portal.publishersserviceassociates.com/carts/war/index.php?